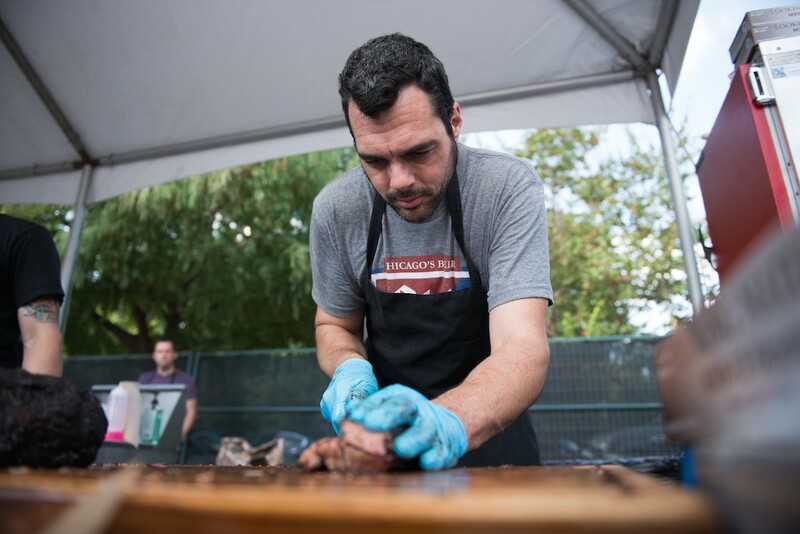 Austin barbecue titan Aaron Franklin will once again 'cue for the cause at this year's Southern Smoke. Photo by Catchlight Photography. Updated 8/2/2017 at 4:10 p.m. Remember to grab your tickets for Southern Smoke 2017 — on sale at noon on August 7. The event takes place rain or shine on October 22. In addition to the new chef line-up for 2017 (listed below), a new Lexus Super VIP ticket, allows a limited number of guests to take a culinary tour with the chefs the Friday before the festival (in a caravan of Lexus SUVs, of course). Plus, since Underbelly and Hay Merchant expect to have a full liquor license by October, Knob Creek has stepped up as a VIP sponsor. Both Blacksmith and Hay Merchant will offer indoor lounges for VIP ticket holders, serving premium wines (Miner, Failla and Krug announced so far) and cocktails from Knob Creek. Once again, chefs Chris Shepherd (Underbelly, One Fifth); Ryan Pera (Coltivare, Revival Market); Seth Siegel-Gardner and Terrence Gallivan, (both of The Pass & Provisions); and Justin Yu (Better Luck Tomorrow) will host the third annual barbecue block party to benefit the National Multiple Sclerosis Society. 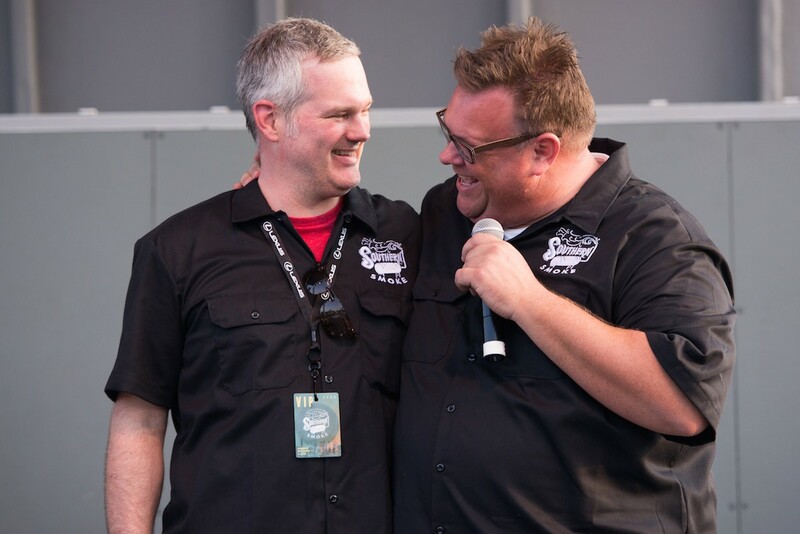 Chris Shepherd and the HOUBBQ Collective host Southern Smoke 2017 on October 22. Photo by Julie Soefer Photography. As before, the flavor fest will surround Underbelly, Hay Merchant and Blacksmith with a savory array of smoked meat, beer and wine served up by a dream team of Southern chefs and pitmasters. This year, they include Austin’s Aaron Franklin (Franklin Barbecue); Charleston’s Rodney Scott (Rodney Scott’s BBQ), Mike Lata and Jason Stanhope (FIG); Raleigh, NC’s Ashley Christensen (Poole’s Diner, Death & Taxes); and New Orleans’ John Besh (Restaurant August, Lüke). Guests can groove to the sounds of Bayou City Brass Band and Folk Family Revival, who will both take the stage during the event. Antonio Gianola and Chris Shepherd celebrate the fundraising effort at a previous Southern Smoke event. Photo by Catchlight Photography. The event was inspired by Shepherd’s longtime friend and former sommelier Antonio Gianola, who was diagnosed with MS in 2014. This year, Southern Smoke aims to raise $300,000 for the MS Society and expands to bi-annual status with a new series of intimate chef’s table dinners, to be held during Spring 2018 at private homes around Houston. These dinners will be collaborative affairs, with each meal prepared by one local and one visiting chef. Local chefs Hugo Ortega (Hugo’s, Xochi), Manabu “Hori” Horiuchi (Kata Robata), Brandi Key (SaltAir, The Dunlavy) and Lyle Bento (Southern Goods) have all signed on to cook, in addition to the founding chefs of Southern Smoke. Stay tuned for the announcement of visiting chefs. VIP package goes for $1000. Visit SouthernSmoke.org for tickets and additional information.